Photo from the Bacolod City website. 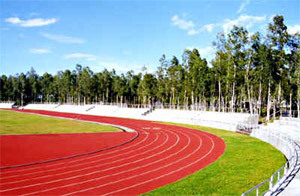 Aside from the football field, the Panaad Stadium also has a rubberized track oval, a 15,500-seating-capacity stadium, and an Olympic-sized swimming pool, among other facilities. As for the “Park” portion of Panaad, scattered among the greenery are replicas of landmarks from 13 of Negros Occidental’s cities and municipalities. The annual Panaad sa Negros, which is a celebration of the festivals of each of the cities/towns of Negros Occidental, is held here in the Panaad Park and Stadium.